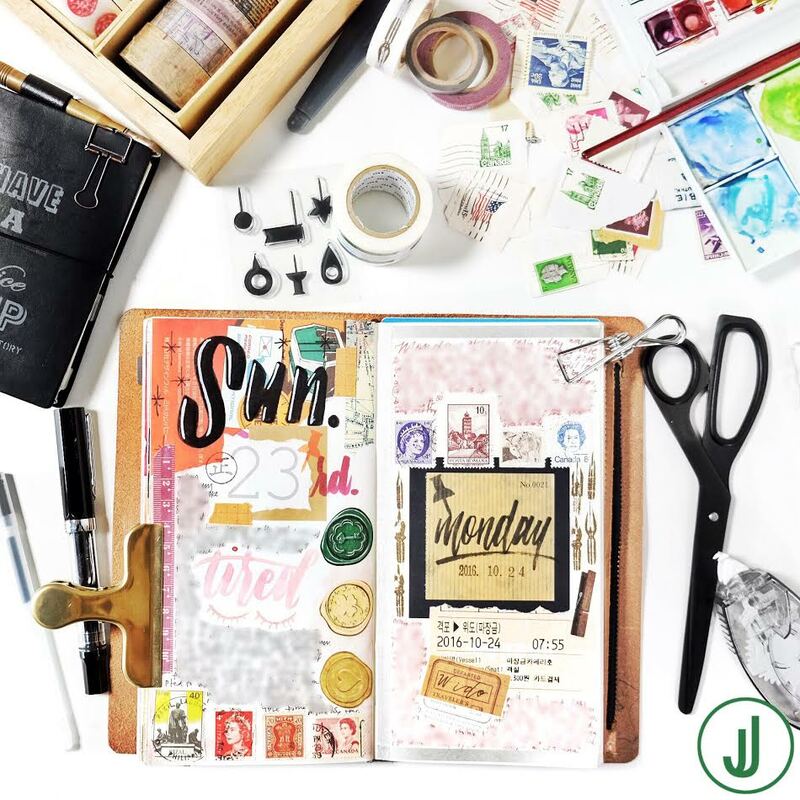 The Journal Diaries is a blog segment where we get a sneak peek into the journals, notebooks, organizers and diaries from creatives all over the world. My special guest today is Job from Canada. - Hi Job! Tell us a little more about yourself? Hi my name is Job and I'm a twenty-something Filipino-Canadian currently teaching and living in South Korea. 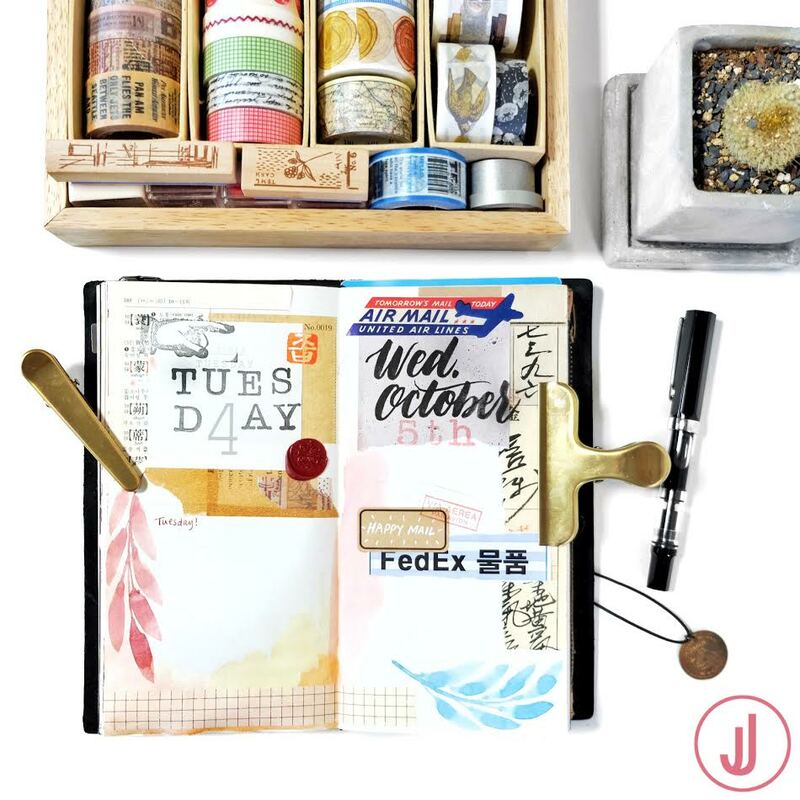 - How long have you been journaling for, and how did your love for art journaling all begin? I’ve been journaling for quite a while but it was often done for school and not for personal reasons. I basically started art journaling and daily journaling about a year ago, July 2015 to be exact. I remember going into this amazing store in Vancouver and seeing the Midori Traveler’s notebook for the first time and thinking “What is that? I think I need one”. I immediately started researching all about traveler’s notebooks and even watched one of your YouTube videos while trying to gather more info about it. At the beginning, I mainly used my traveler’s notebook as a planner but it slowly transformed into a daily journal where I write about my day’s events. 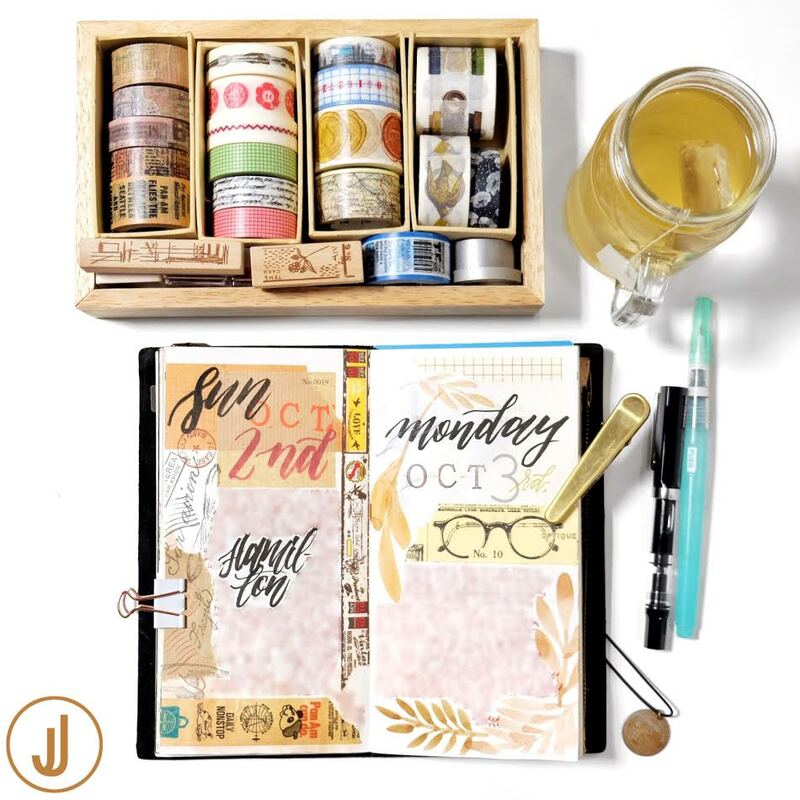 - In what ways, would you say, has journaling helped you? Journaling has helped me in such a large way. I initially started journaling during a very formative time of my life. I was about to finish my degree and I was nearing a new and scary chapter of my life, which was post-grad life. My journal was a place where I could write about my fears and worries about the future, while also serving as a place to record the amazing changes that have occurred, and are occurring in my life. Coincidently, shortly after I started daily journaling, I also decided to move halfway across the world to Korea and start my career in a foreign land. My journal has honestly captured such an incredible time in my life and it has helped me grow so much creatively and personally. - What inspires you to write and create? It sounds so cheesy, but everyday life events inspire me so much. It might be the fact that I live in rural Korea and everything around me is vastly different to the life I’ve lived in Canada. The culture, the traditions, and the little things, (like the look of unpaved roads, the smell of the beach and design of the milk cartons) have aggregated to create such a rich and intense experience for me. My experiences here have been so quirky and different that it’s hard not to write or journal about it. My friends and family inspire me to create as well. They are quite supportive and they continuously provide me with feedback on things I could improve on. - Who are some people that motivate or inspire you creatively? I was searching videos on YouTube one day and stumbled on an interview with Aaron Draplin, a graphic and logo designer, and one of the cofounders of the Field Notes Company. He’s such a charismatic person and his passion for design has definitely inspired me when I feel too lazy to create something or to journal. At this point, I think I’ve watched and listened to every video or radio show about him and I always take something away from it. 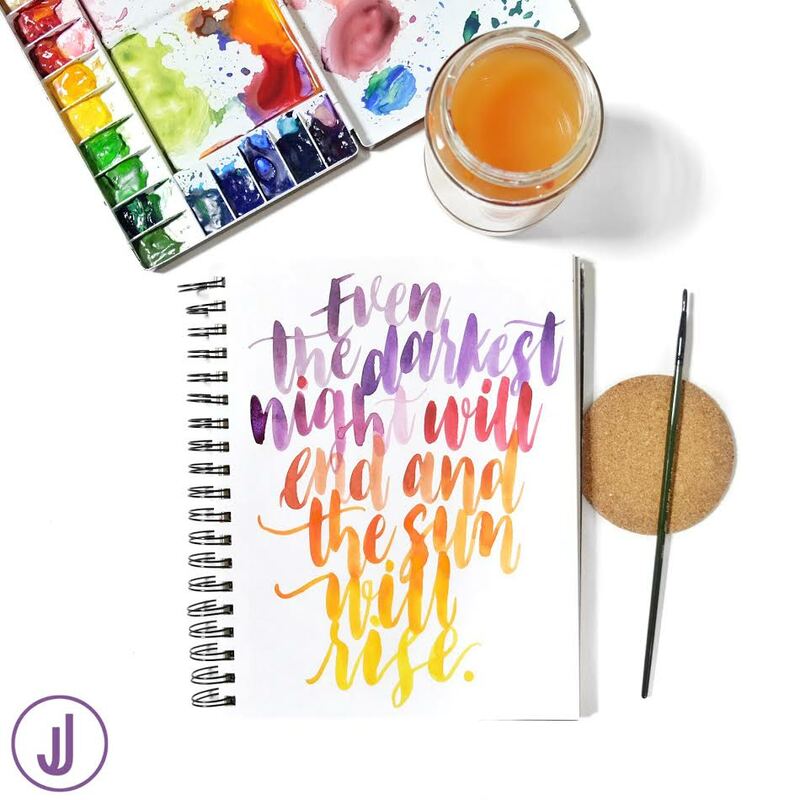 The journaling and calligraphy community on Instagram is quite remarkable and I often find myself looking through my Instagram feed and quickly locking my phone to start journaling and creating. Everyone on that platform is so creative and I feel so inspired to create after a quick peek at everyone’s current posts. - How long have you been using your Midori Traveler's Notebook, and what drew you to it? I’ve had my Midori Traveler’s Notebook for a little over a year now. I was drawn to the Midori Traveler’s Notebook because it's a totally customizable system. The ability to change the types of inserts that go inside the notebook was the biggest selling point. Like I said earlier, I purchased my Midori so I could use it as an agenda. I used to swear by the hardcover Moleskine agendas, but I hated the fact that I could no longer use the agenda after that year. 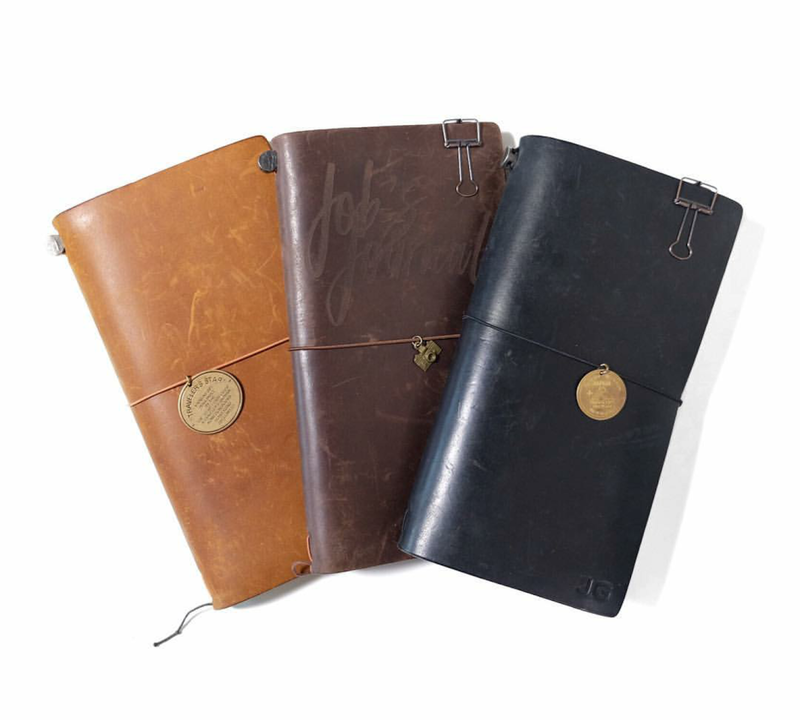 In addition, I always loved the look of worn in leather, so I wanted a leather notebook or agenda that could change and age with me. The Midori Traveler’s Notebook basically fulfills my criteria for the perfect notebook due to it’s reusability and it’s ability to age and change with its user. 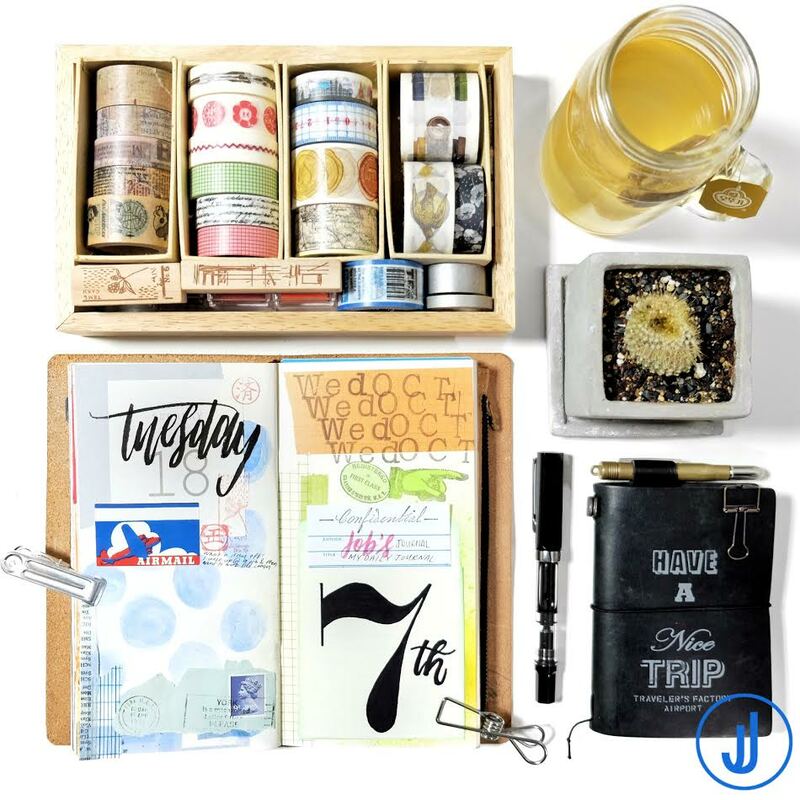 - How are you currently using your Midori Traveler's Notebook, and how is it set up? I use a regular-sized traveler’s notebook as both an agenda and daily journal, and it’s part of my everyday carry. In that notebook, I keep a monthly calendar insert which serves as a catch all agenda for work and personal events and a blank or grid insert which contains my daily journal. Since I try to journal everyday, my journal acts as a makeshift art journal and brain dump depending on the day. I do have multiple traveler’s notebooks in the regular size, so I try to rotate the notebooks so they all get some use. When they are not in use, these traveler’s notebooks hold completed inserts as well as my collage notebook and reading journal. I also have a passport-sized traveler’s notebook, which acts as a bullet journal, and holds all of my tasks for the day. I recently started bullet journaling so I’m still trying to figure out a set up that works for me. As for traveling, I usually bring a regular-sized traveler’s notebook (usually my black one) and I swap out the inserts so it only holds one insert for journaling, a kraft folder to hold pamphlets, itineraries and tickets, and lastly a zipper pocket to hold my passport and other documents. I’ve used this set up various times during travels, and I find that it keeps me quite organized. - Do you carry your Traveler's Notebook around often, or is it kept mainly at home? I try to bring my regular-sized traveler’s notebook everywhere I go. Although it’s quite large, if I have a backpack with me, I will almost always bring my traveler’s notebook with me since it holds important information that I refer to on a regular basis (like transit times, various schedules and reminders). - Which Midori Traveler's Notebook color is your favorite? My favourite notebook is definitely my black traveler’s notebook. It was my first traveler’s notebook and I love black leather goods. This particular notebook is so dinged and scratched up and it just reminds me so much of my various travels and adventures. 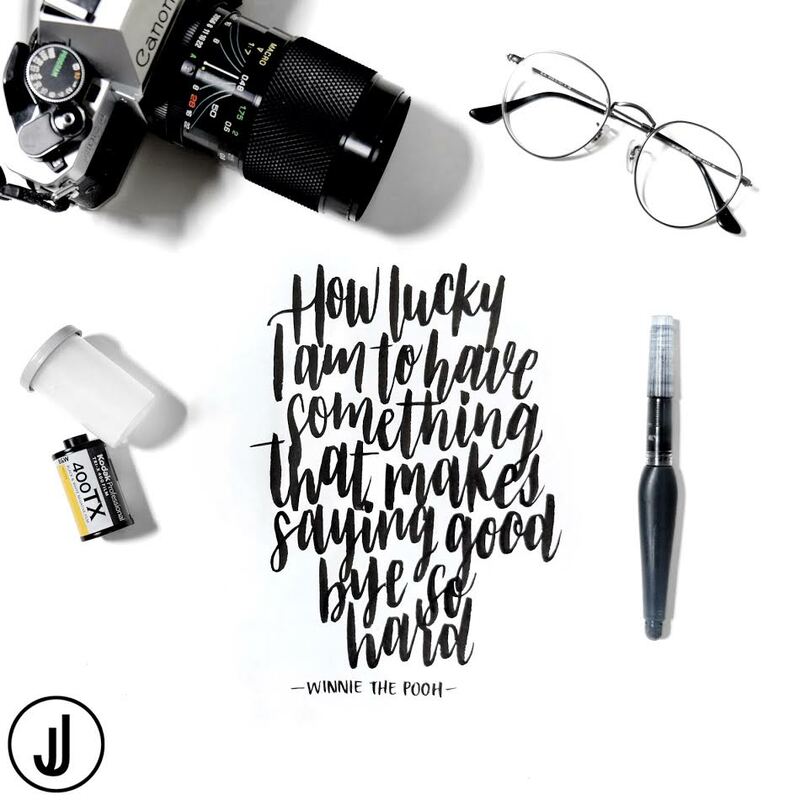 - How and when did you get into your calligraphy hobby? I started learning calligraphy around the time that I bought my first fountain pen, which was also around the same time I purchased my first traveler’s notebook. I was looking for a hobby that I could do to de-stress and decompress after a long day at school. 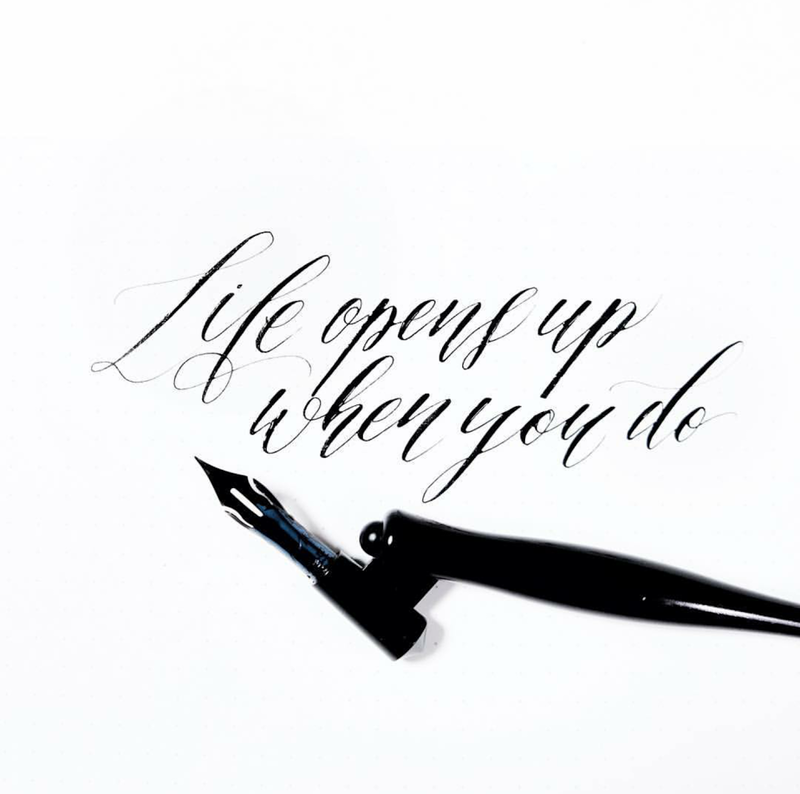 It honestly was the opposite of that because I got so frustrated when I started learning calligraphy. I wanted to see results right away but that obviously wasn’t the case. I quickly ditched pointed pen/dip pen calligraphy and opted for brush calligraphy and I found myself enjoying brush calligraphy more. Now I try to practice both types of calligraphy. I’m not great at it but I’m learning and that’s what counts. 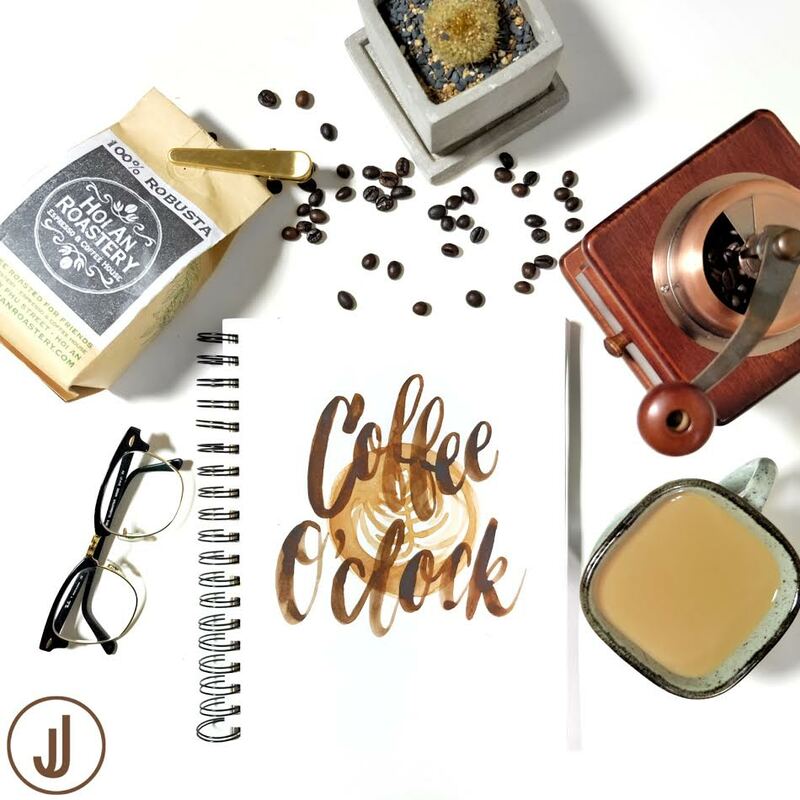 - Is there a particular time of day that you find yourself journaling or creating more than others? I love mornings, but there isn’t any time to journal in the morning for me, unless it’s during the weekend. Most of the time I journal in the evening and it’s a great way to reflect on the day. - What are some of your favorite art supplies that you're currently enjoying? I’m loving clear stamps at the moment. I recently received my first clear stamp set (it’s a Recollections Alpha set) in a care package from my family. I’ve always loved rubber stamps but clear stamps allow you to see exactly where you’re stamping on the page. - What are your go-to pens at the moment? I’m a fountain pen enthusiast so I generally reach for a fountain pen when I’m writing something down. 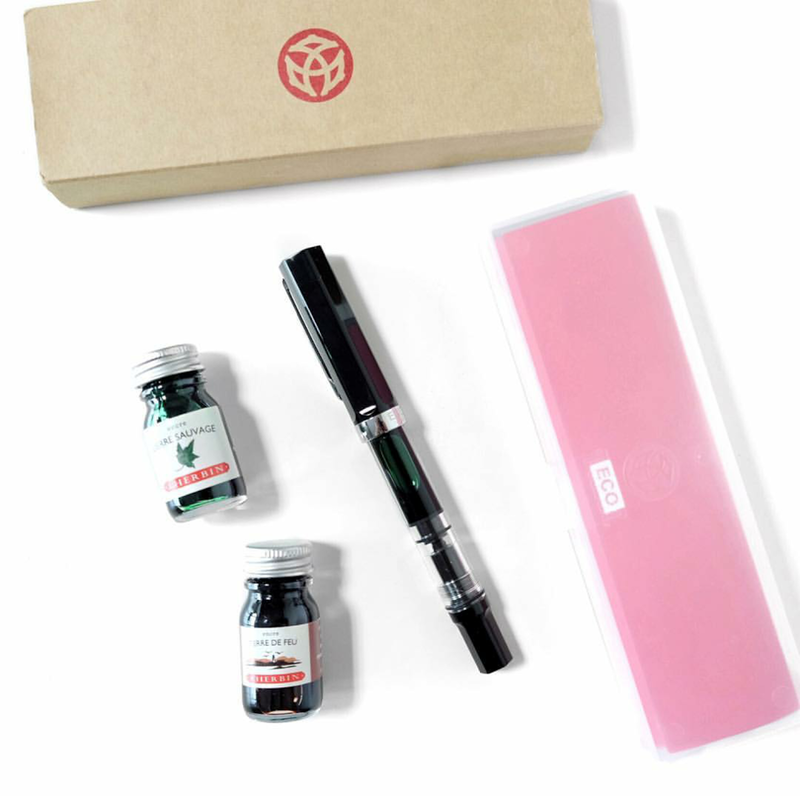 My current favourite is probably my TWSBI Eco in black since it’s such a smooth writing pen. When I’m not writing with a fountain pen, I like to reach for the Muji 0.38 pen for writing and the Pigma Micron 01 pen for drawing and lettering. - Are there any craft or stationery stores that you favor? I love The T.I.ME Stationery store in Seoul. It’s run by Seong Joon Shin, a fellow traveler’s notebook user and mini celebrity in the traveler’s notebook scene in Korea. His store is probably the next best thing to the Traveler’s Factory store in Nakameguro, Japan. Back in Vancouver, I love the Paper Ya store for its quirky stationery selection and The Regional Assembly of Text stationery store for vintage themed stationery. I’ve always wanted to visit the Baum Kuchen store in Los Angeles, but alas I’ll have to settle for their wonderful online shop. Black. I know it’s technically not a colour, but I love black and how simple it is. Whether it is for clothes, leather goods, ink, or electronic devices, I think black just looks so sleek, classy and timeless. This is probably the most difficult question since I’m such a foodie and love many different types of food. If I had to narrow it down though, it would be DimSum, Filipino-style barbeque and ice cream. It’s just too difficult to choose one. I’m a guy! Since I haven’t shown my face or a photo of myself, many people think I’m a female. I guess there just aren’t that males within the crafting and journaling community, so people assume that I’m female. Although few, there are many great male journalers, and traveler’s notebook enthusiasts like Seong Joon Shin (@seong.joon.shin), Harry (@harry.ix), Juan Estey (@juanestey), Miguel (@acupandpages), and of course Patrick Ng (@patrickng). - What advice, tip, or suggestion would you give for anyone looking to start their own path in art journaling or creative works? As Nike puts it, just do it! I feel like everyone has answered this question similarly one way or another, but I think it’s true. Although we may have voices in the back of our head saying otherwise, just going out and starting an art journal or new creative endeavor is the best way to dismiss those fears and anxieties. Sure you won’t be perfect at it in the beginning, but just like any other skill, you will learn and become better. I love photography, more specifically film photography. Although it’s difficult, and at times expensive, I find so much more satisfaction in taking time to frame shots with a film camera than haphazardly taking hundreds of photos on a digital camera. Don’t get me wrong though, I love digital photography, and you can always find me attached to my Fujifilm X-T1 digital camera when I’m not using my Canon AE-1 film camera. 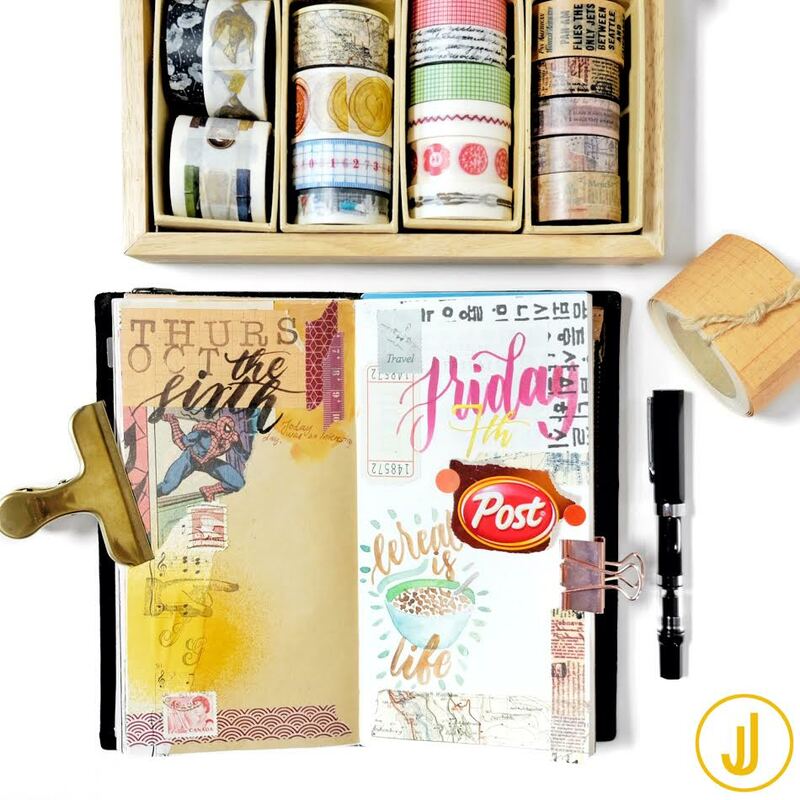 Job, thank you so much for sharing your art journalings and creative works with us! Such a pleasure.